Take a bowl and mix the shredded coconut with 300 ml coconut milk. Keep this mixture aside for 30 minutes. Add the remaining coconut milk, saffron threads and the erythritol. Mix thoroughly. Add the cardamom powder and cook the mixture for another 5 minutes. Take a baking tray (16 cm/ 6.3 inch square tray), butter it and spread the mixture evenly, up to 1 cm thick. Freeze it for 2 to 2 ½ hours. 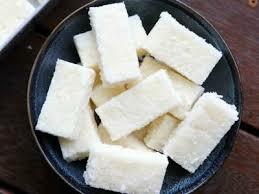 Cut small squares according to your own liking and the barfi is ready. Refrigerate for up to 5 days or if too soft, freeze for up to 3 months.